The 142-year-old Stewart Alternative Elementary School in Columbus, Ohio, has been transformed into a vibrant, modern center of learning for area students. Reopened in January 2015, the renovated and expanded school features high-performance Wausau Window and Wall Systems’ windows with access doors and between-glass blinds that enhance the building’s historic aesthetic. Wausau’s products also support the U.S. Green Building Council’s (USGBC’s) LEED® for Schools Silver certification, which the school received in August 2015. The Ohio Facilities Construction Commission (OFCC) has championed more than 200 LEED-certified schools across the state since 2009. “We’re very proud that Wausau’s windows can be seen on many of these schools, both new construction and renovation,” said Wausau’s Central regional sales manager, Lisa May, LEED Green Associate. Originally built in 1874 and located in Columbus’ historic German Village neighborhood, the building underwent two major renovations, the last one in 1926. The Columbus City School district had planned to renovate the building at a later date, but a 2010 fire accelerated the district’s timeline to update the building. Columbus-based architectural firm Hardlines Design Company (HDC) was selected to lead the $11.2 million project, which included a complete renovation of the existing 28,000-square-foot building and construction of a new 18,000-square-foot addition. Since the building is listed on the National Register of Historic Buildings, it was essential that the architectural elements of the renovation and new construction replicate the original building as much as possible. Under the direction of general contractor Miles McClellan Construction, glazing contractor Richardson Glass Service, Inc. installed more than 130 of Wausau’s 3250i -XLT INvent™ Series high thermal performance, simulated double-hung windows. Part of the Advantage by Wausau® standard product offering, these windows are competitively priced and available on an accelerated delivery schedule to meet schools’ value-focused budgets and condensed construction schedules. All of Wausau’s INvent windows are backed with an industry-leading warranty of up to 10 years. The windows installed in the new addition were configured in tall units stacked two-high for easy installation. Both the new and historic sections of the school benefit from Wausau’s modern performance, but differ aesthetically. Reflecting a more contemporary look, the new addition’s windows do not have divided lites and were specified with square tops. 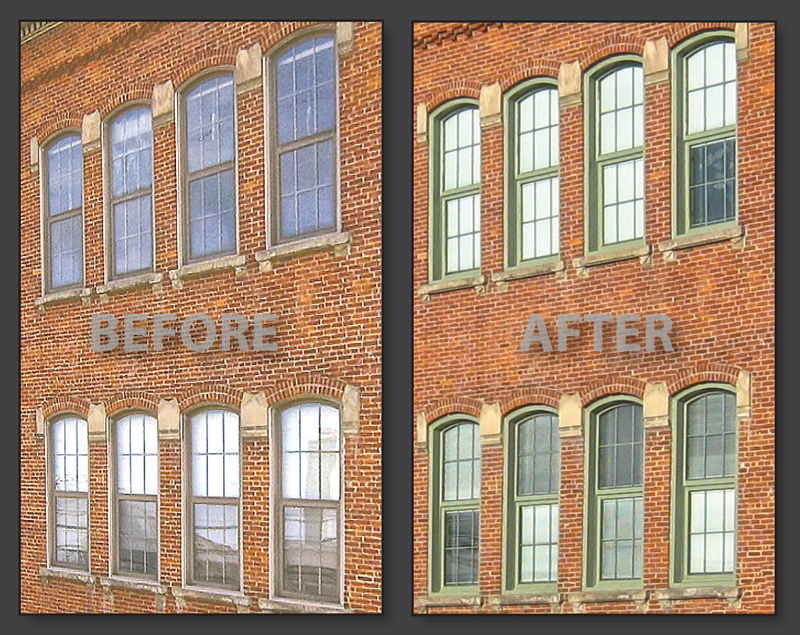 “For the historic portion of the school renovation, our simulated double-hungs are project-out units that mimic the look of traditional hung windows with arched tops and divided lites. Projected windows overcome inherent issues with counter-balancing added weight of insulating glass in double-hung sash, while offering higher performance, ease of operation, and a range of glass options to optimize energy efficiency,” explained Wausau’s May. Linetec finished all the exposed aluminum of Wausau’s doors and windows, including muntins, on Stewart Alternative Elementary in Patina Green. Linetec’s in-house blending laboratory created this custom color using a two-coat, 70 percent polyvinylidene fluoride (PVDF) resin-based mica coating. As an environmentally responsible finisher, Linetec captures the liquid paints’ volatile organic compounds (VOCs) to eliminate the exhaust of potential pollutants. Tested to meet the stringent AAMA 2605 specifications, the resulting, durable coating ensures a long-lasting finish for both the interior and exterior. Looking outside through Wausau’s doors and windows, students and staff see new playgrounds, new green space and new onsite parking. To make this and the school’s expansion possible, the school district acquired a nearby property to double the size of the lot to nearly 2.5 acres. Inside, the building contains the school’s first-ever gymnasium. (Prior gym classes were taught in the cafeteria or at a nearby city park). Other new spaces include a media center, computer laboratory, cafeteria and classrooms for up to 350 students. Every classroom is outfitted with wireless technology and, for the first time, the entire building is air-conditioned. Students, staff and community members have praised the renovated and expanded Stewart Alternative Elementary School. In May 2015, the building was awarded the German Village Commission and German Village Society Caretakers of Legacy Award. 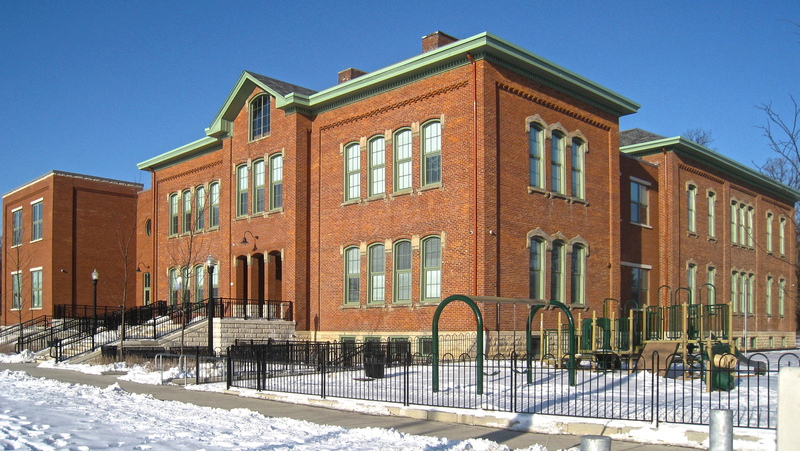 In October 2015, it received the Heritage Ohio Best Historic School Award. Nationally recognized for its innovative expertise, Wausau Window and Wall Systems is an industry leader in engineering window and curtainwall systems for commercial and institutional construction applications. For more than 55 years, Wausau has worked closely with architects, building owners and contractors to realize their vision for aesthetic beauty, sustainability and lasting value, while striving to maintain the highest level of customer service, communication and overall satisfaction. Wausau is a part of Apogee Enterprises, Inc., a publicly held, U.S. corporation.